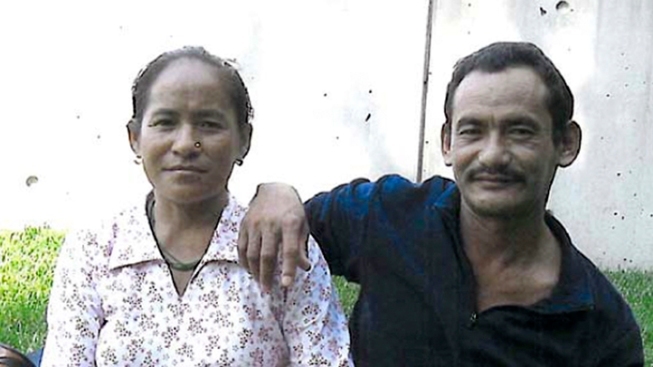 This undated photo released by the Philadelphia District Attorney's Office shows Karnamaya Mongar and her husband, Mr. Mongar, no first name given. According to the District Attorney's Office, the 41-year-old Karnamaya Mongar suffered a fatal drug overdose during an abortion procedure at the Women's Medical Society in Philadelphia. Abortion doctor Kermit Gosnell, who catered to minorities, immigrants and poor women at the Women's Medical Society, was charged Wednesday Jan. 19, 2011, with eight counts of murder in the deaths of a patient and seven babies who were born alive and then killed with scissors, prosecutors said Wednesday. Yashoda Gurung's family survived 20 years in a refugee camp after fleeing war-torn Bhutan. But her mother died months after arriving in the U.S. in 2009 and seeking a legal abortion in Philadelphia. Karnamaya Mongar's overdose death is the subject of one of eight murder counts in the ongoing trial of Dr. Kermit Gosnell. The 72-year-old Gosnell is also charged with killing seven babies born alive. New to the United States and struggling financially, Mongar believed an abortion was the best option, her daughter, 26, testified. Gurung and her family settled in Virginia as part of a Bhutani Refugee Resettlement Plan. Mongar did not speak any English and her daughter understood very little. Mongar, 41, became pregnant soon after and decided that she needed an abortion, citing her new surroundings and her family's financial hardships. She initially went to two clinics in Virginia, Gurung said, but she was turned away because those clinics would not perform abortions past 14 weeks. Gurung said her mother was 14 to 15 weeks pregnant at the time. Mongar was sent to a clinic in Washington, D.C. and was again denied. She eventually found Dr. Gosnell's clinic in West Philadelphia. Gurung said they drove five hours to Gosnell's clinic and were told the procedure would take two days. Doctor at Marathon Finish Line: "It Was Like a War"
Through a translator, Gurung testified Tuesday about the labor-inducing drugs and painkillers her mother was given as she waited hours for Gosnell to arrive for the procedure. She said on the first day, her mother was given a pill to help ease the procedure and painkillers. When she returned the for the abortion on the second day, Gurung said her mother was then given white pills and rested on a recliner in Gosnell's waiting room, complaining of pain and dozing off. "She said, 'It hurts all over,'" Gurung testified. Gurung said her mother was given an IV and her blood pressure was monitored. Gurung went into a waiting room while her mother entered another room for the procedure. Gurung said she heard clinic employees talking about 'an Indian lady' and assumed they were talking about her mother's procedure. She said her mother was later taken to a hospital, but only after firefighters struggled to cut bolts off an emergency door. Gurung said it took more than an hour for the ambulance to arrive at the clinic. Mongar died the next day. Gurung testified that she and her uncle were driven to the Hospital at the University of Pennsylvania where they waited in the parking lot. Eventually, she said, they were called in by doctors. Gurung testified that the doctors told her, "We tried our best, but your mother's heart stopped." Mongar had gone into cardiac arrest. Her death was ultimately ruled an overdose of the sedative Demerol. Defense attorney Jack McMahon told jurors about a letter that Dr. Gosnell sent to Gosnell's family, describing what happened and expressing his sympathy. But when Mongar's brother took the stand, he said Gosnell's letter "did not express any sympathy." Dambar Ghalley also testified that Gosnell came up to him at the hospital and said, "I did nothing wrong. I'll be happy to answer any question, any time and anywhere." The family, which lives in Virginia, has a wrongful-death lawsuit pending against Gosnell.